Need a shopping cart, CMS, MySQL, Wiki or a WordPress Blog? Net Atlantic is committed to the highest levels of delivery available for your email communications. As a result, we have partnered with Return Path to utilize their technology services to help achieve this goal. Return Path manages the largest worldwide network of email and mailing data collected from multiple sources, and partners with leading Internet Service Providers (ISPs) and Email Service Providers (ESPs) to ensure best practices and reliable delivery to its participating network of partners. Net Atlantic will be able to get critical network and Internet information faster and thus better monitor and manage the proper delivery of your email. With this new partnership, combined with several other ongoing efforts, we continue to make it a major priority to strive for the best possible delivery of your email campaigns to your valued subscribers. One of the most popular services introduced by Net Atlantic during the past year is the reseller program. Used by ad agencies, interactive marketers, webmasters and others, this fully-branded white label solution provides you with a complete email marketing product that you can sell independently. Resellers can manage lists, add and remove multiple administrators, allow their clients to view online reports and take advantage of our discount pricing tiers. Contact an account executive for more information. Starting June 1, Enterprise Level customers will receive one additional gigabyte of bandwidth for a total allocation of two gigabytes per list each month – at no extra charge. This change will be reflected in July billing statements. Please contact support@netatlantic.com if you have questions. Q: How long have you worked at Net Atlantic and in the tech industry? A: I started at Net Atlantic in April of 2007 and have been professionally working in the tech industry since 1996. Q: What is the best part of working with customers? A: Educating them on current technology and trends. It is surprising how many people are dependent on email and the Internet, but they do not entirely understand the rules of such technologies. This is where I come in. Q: Congratulations. You were recently certified by the Help Desk Institute. What does this mean for your department? A: For the department it means we’ve all passed a standard certification and are collectively aware and better educated on how to respond to certain situations involving the support system at Net Atlantic. It also gives our customers confidence that Net Atlantic participates in global standards for excellence in responding to issues, understanding the customers’ needs not only technologically, but also emotionally -- very important when it comes to supporting technologies that are responsible for running businesses. Making sure things run smoothly is part of our mission. The HDI certification has fine-tuned support services in key areas, and together we feel more confident when using these tools on a daily basis. HDI has been a great asset. Q: Is there anything you’d like our customers to know? A: One of the most important things is to be thorough when explaining an issue you might be having. Reference your Net Atlantic product, whether email list or Web hosting services, for example. The more information you provide the better. It is important that our customers realize that we are here to help them – that they are not “bothering” us. We are more than happy to assist you in any way possible, and I’d like to reassure you that when there is an issue, there is no such thing as an “unnecessary” or “silly” question. Q: When you talk with customers, are there things you mention that they are surprised to learn? A: Yes. Many are surprised to learn how easy segmenting is, that with just one click you can create a segment based on existing tracking statistics (in Enterprise Level). This is a great feature because you can resend an email to people who didn’t open the first email, for example. Also, some customers don’t realize that demographic fields can be merged, like the “fullname” option merges a recipient’s first and last name. This helps when personalizing salutations. And, some Web hosting clients are unaware of how many features come with their service (see Web Site Tips & Tricks for more information). Q: There is a fishbowl filled with chocolate on your desk. What’s that all about? A: The fishbowl is something I started a bit over a year ago. It is a place where people can drown their daily woes in chocolate and feel better about their day. It is filled with happiness and calories. Regardless of how a coworker or visitor feels when they approach my cube, they always leave with a smile. Also, I like to think of my personality as “psychological chocolate.” Customers enjoy and appreciate someone who understands them, and I surely do. I like to put myself into the clients’ shoes so I can fully understand what it is like to be in their situation. Need a shopping cart, content management solution (CMS), MySQL, Wiki, or a WordPress Blog? All of this and more is already included with all Net Atlantic Web hosting plans. Designing a site is easy with our Web site builder. More tech savvy? Do your own programming and use databases to connect directly to your content and Web site. Check out our exciting Web hosting features. We’d like to help you get the most from your service. Contact tech support if you have questions. Read how to generating revenue, optimize your site, manage your Web site and business. Learn more about Web page design, clean layout techniques and template building. Read articles on Google Adsense, Web site backlinking, blogging, and more. View information on all things blog, content about Web hosting, traffic tips, and more. For more information on our webhosting services visit www.atlanticwebhost.com. Does your email newsletter look tired? Is it performing below your expectations? Maybe it’s time to jazz up your communications. Two lucky customers will receive an in-depth professional evaluation of one of their recent emails. We will review your sign up/welcome process, newsletter content, design, and format. Then we will redesign your template and spam test and render it in all major ISPs and email clients. Use the new template and we’ll compare the results. Enter to win a free email newsletter makeover. Net Atlantic clients come from all industries, organizations, beliefs and backgrounds and we value this diversity. As the Internet fosters open communication, we support all customers by helping them share their messages online. This column focuses on a featured client’s email strategy, results, marketing ideas, and more. Air America Media is the nation’s leading progressive media network, representing a smart, entertaining andindependent political voice on-air and online. Rachel Maddow, Montel Williams, Chuck D, Ron Reagan, David Bender, Ron Kuby, Lionel, among others, provide insightful commentary infusing Air America’s wit and insight into daily topics in the news. See www.airamerica.com. Delivery rate for April’s “The Wire” is 99%. Email should have a focused goal; ours is to drive traffic to our Web site. We offer a variety of content that our customers are interested in: video clips, news and current events. Recurring features like “Around the Web in 80 Seconds” are popular with customers. We are currently experimenting with subject lines and comparing open rates. It’s helpful to view email as an extension of your Web site; keep email informative and fresh, always offering some new content. Engage your customers with action. Our emails provide options for listening live, downloading content, viewing videos and visiting our site. 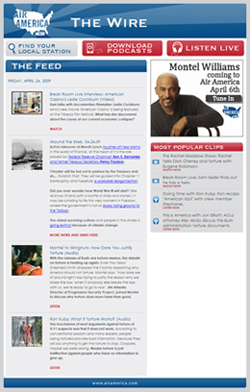 We thank Air America for sharing their newsletter. If you would like to suggest your newsletter as a feature in a future issue, contact us. Sean Corey is Net Atlantic’s new Linux system administrator. Corey most recently worked as a Unix/Linux support engineer for Fidelity Investments and also has additional information technology experience as an administrator, security expert, and help desk technician. Jermaine Anderson is Net Atlantic’s new inside account executive. Previously, he worked as a sales consultant for Treeline, Inc. and an outside sales representative for World Wide Acquisitions, BSI. Jim Jaworski was hired as outside account executive. Jaworski formerly served as director of business development and sales for Insitech, Inc., and major accounts sales executive for Oracle Corporation. Eric M. Davis was hired as Net Atlantic’s new customer service representative. He most recently worked as a production coordinator for Countrywide Home Loans and previously as an account executive for Gateway Computers. Marijke L. Cullen joined Net Atlantic’s billing team as client account administrator. Her previous experience includes working as a sales recruiting coordinator for One Communications and billing administrator for Ferncroft Country Club. Shane McCarthy was promoted to Director of Sales & Marketing. McCarthy’s professional background includes software, telecommunications and audio/visual markets and he is actively pursuing an M.B.A. at Bentley University.